From 09:00 to 09:30h Reception and handing of the material. 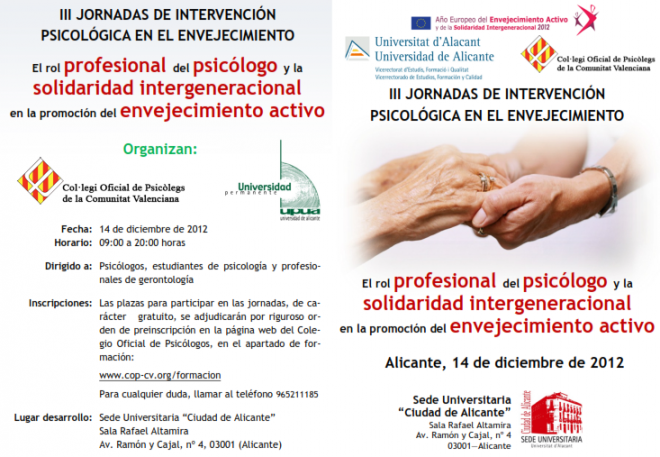 From 10:00 to 11:00h Conference: "The professional role of the psychologist in promoting active aging". Dr Ms Mª Dolores López Bravo. Permanent teacher of Psychology and Director of gerontological programs. Dean of the Comunitat Valenciana Psycologists' Official Association and President of the General Council of Psycologists' Associations. Ms Mª Cecilia Gómez Lucas. Vice President of Studies Planning, Training Actions and Quality Standards of the University of Alicante. Vice President of the Comunitat Valenciana Psycologists' Official Association in the venue of Alicante. From 12:00 to 13:30h Forum-Debate: Video "Types and stereotypes in the old age"
Dr Ms Esther Sitges Maciá. Permanent Teacher of Psychology. Vice President of Culture and University Extension. University of Miguel Hernández in Elche. Dr Ms Beatriz Bonete López. "Experience's University Lectures". University of Miguel Hernández in Elche. Dr Mr José Miguel Latorre Postigo. Permanent Teacher of Psychology. Member of the Investigation of Neurological Illnesses Centre (IDINE). University of Castilla La Mancha. Help provided to older adults by the Red Cross. Ms Teresa Romero Sánchez. Provincial Director of the Program for older and disabled adults, Spanish Red Cross in Alicante. Contributions of the Permanent University of the University of Alicante. Mr Alberto Plaza Salán. Teacher of Cognitive Stimulation at the Permanent University of the University of Alicante. Programs and activities to promote a successful aging. Ms Mª Isabel Buitrago Gómez. "La Caixa" workshops. "Alicante, an intergenerational city". Ms Mª Clara Aguado Barahona. Psychologist of the Dependent Older Adults Home. "La Florida". From 17:30 to 18:30h Conference: "Intergenerational Programs"
Dr Ms Sacramento Pinazo Hernandis. Permanent Teacher of Psychology. Psychobiology and Social Psychology's Department. Faculty of Psychology. University of Valencia. Mr Juan Luis Quevedo Rodríguez. Member of the Executive Board of the Comunitat Valenciana Psychologists' Association at the venue of Alicante. Ms Mª Clara Aguado Barahona. Coordinator of the third age working group of the Comunitat Valenciana Psychologists' Association at the venue of Alicante. Aimed at: Psychologists, Psychology students and Gerontology professionals.